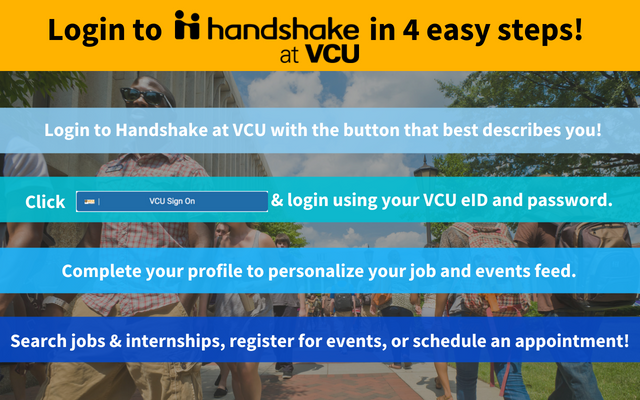 Sign in to Handshake at VCU! Our goal is to help you develop a plan for defining and achieving your career and professional goals starting your first semester at VCU. We offer individual advising appointment to students and alumni during their first year after graduation. All VCU students may use our services. The School of Business and College of Engineering also have individual career centers. Hours: Monday-Friday, 8 a.m.-5 p.m. Drop-ins welcome Monday-Friday, 11 a.m.-3 p.m., no appointment needed. Make an appointment by calling (804) 828-1645 or stop by the office.